New Twitter users are a disloyal bunch, according to data from Nielsen Online, a metrics firm that measures Internet traffic. More than 60 percent of new users fail to return to Twitter the following month after they sign up, according to a blog post by David Martin, Nielsen's vice president of primary research. Martin believes loyalty is a problem for Twitter, because despite Twitter's explosive growth in recent months, the number of Twitter's returning users -- the retention rate -- does not outnumber those giving up on Twitter after trying out the site. This could prove problematic, because while a high retention rates doesn't guarantee a site's success. it is a prerequisite for growth. 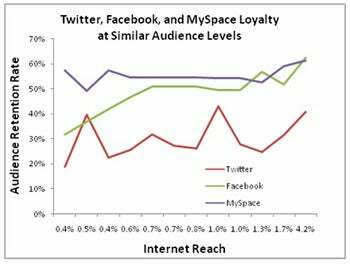 To support his assertion, Martin points out that both Facebook and MySpace had retention rates around 70 percent when they were emerging sites like Twitter is now, while Twitter languishes below 40 percent. Things have improved, though; before Oprah started tweeting and Ashton Kutcher took on CNN for Twitter dominance, Twitter's retention rate was below 30 percent. While these numbers may sound troubling for Twitter's future, I think Nielsen could be way off base with this report. Martin didn't say how Nielsen came to these numbers, but if the evaluators simply determined Twitter's popularity by measuring visits to Twitter.com from Web browsers, then Nielsen's numbers are completely inaccurate. The reason is that unlike other social networks, Twitter's primary use is not really as a Website but an Internet-based communications service. That may sound like Web 2.0 nonsense, but consider that once you've signed up for Twitter on its Website you could, theoretically, never visit Twitter via a Web browser again. That's a gigantic difference when you compare Twitter to Facebook and MySpace. For example, to really get the most out of your Facebook network you have to be on the site viewing photos, responding to messages, listening to music, playing games, and so on. It's true that you can access Facebook with an iPhone application and other programs, but the action you can take within those applications is limited. Ultimately, all Facebook actions lead you back to Facebook.com. Twitter, on the other hand, offers a personalized stream of text-only messages of 140 characters or less that can be accessed any number of ways. Instead of visiting the Twitter Website, you can use one of the multitude of other access points like desktop or smart phone applications, browser add-ons, Gmail gadgets, and text messaging. This is possible because of Twitter's virtually wide-open application programming interface (API), which allows software developers to build Twitter applications that are designed to rob Twitter of Web traffic. TweetDeck, for example, is a desktop application that lets you send and receive messages, perform a Twitter search and even follow new people right from your desktop. Granted, it's unlikely that a user would never visit Twitter's site, but with so many ways to access the service, daily visits to Twitter.com via a Web browser will automatically be reduced. So before we start writing Twitter off as a fad, Nielsen needs to explain how it compiled its data and whether it considered Twitter's open API in its research.